This unbanded beauty is a puro in two ways… The wrapper, binder, and filler are all Nicaraguan, and they are also all Aganorsa tobacco. Lirio Rojo means “red lilly” and apparently only 2000 were made in 2015. How did I manage to get 3 5 packs in 2017 then? Not sure, but I believe there were other production runs in later years. Size: All reviews say 5.5″ x 44 but I measure it out at 5.75″ x 46. Cost: Usually around $10, I got them on a discount for $7.50 from rodrigocigars.com. If you are not on his mailing list, you should be. George comes up with discounts on good cigars every couple of months and will email you when he does. Wrapper & Color: Medium brown, smooth, no veins, slightly grainy to the tongue. Cold draw: Draw itself is a medium, flavor reminiscent of black tea and wood. Construction: Smooth wrapper, no veins, evenly packed but not dense. Looks good. Draw is medium and stays medium throughout the stick. Does not plug behind the coal. Burns straight. Only minor corrections once or twice per stick. Have smoked 8 of these now and it took a few of them to learn how to smoke them. Smoked at my usual pace, the smoke gets a little thin and they tend to go out somewhere around the middle of the stick. I’ve learned to smoke these a little faster than I normally do, but they did not get hot as a result. Flavor stayed with the stick throughout and smoke output remained strong. First third: A little pepper, but only a little. The cigar starts out with cedar and other wood, tobacco. A little sweet mint on the retrohale, dry toast, black tea, grass, and maybe a little leather. Not at all a sweet stick, but no sourness either. 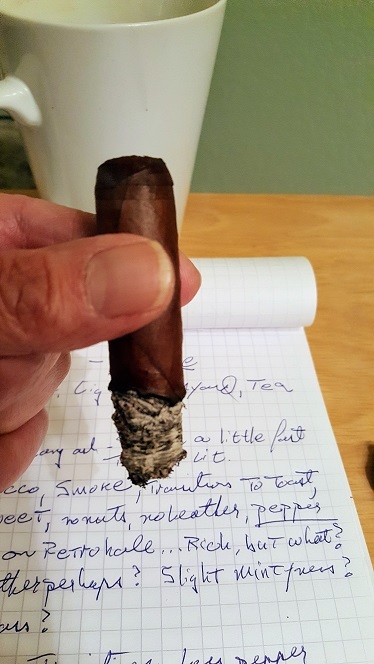 I like the smoke, but is not nearly as sweet as I expected from a Warped cigar. Second third: The toast becomes a little sweeter, like melba-toast. Grass and tea still present. The [barely-mint] remains, leather disappears. Pepper stays in the background. 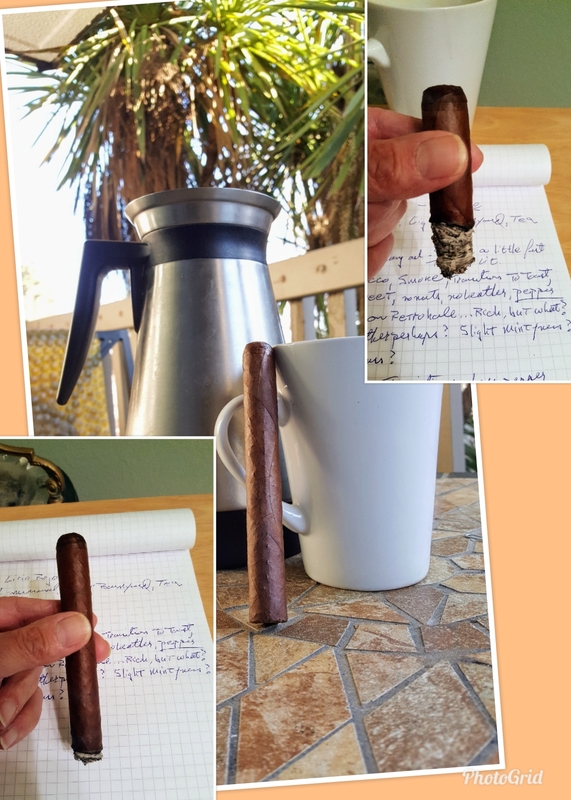 Not a sweet cigar, but I’m still enjoying the experience. Last third: Not much transition here but some. Pepper comes forward a bit, but still not a lot of it. Sweetness drops off and the cedar and black tea comes up. Able to smoke it down to the nub. Flavors never get harsh. Smoke time 1 hour. Over all I like this stick. I can’t say it was sweet but it is a good offering from Warped, something different. I have smoked these with various rums, but no pairing stands out. What does stand out is coffee! This is a great cigar for a coffee pairing. Here are two other reviews for your reference. The Katman review is a bit mixed but ultimately he likes the cigar. I like Developing Palates reviews, they use two reviewers and print both reviews in parallel. All three of these reviewers, and especially the last two list many flavors, lots of pepper, and the team review basically raves about the stick. I liked it, but did not find it so rich and varied as the other reviews. They smoke well once you have the pace down right.